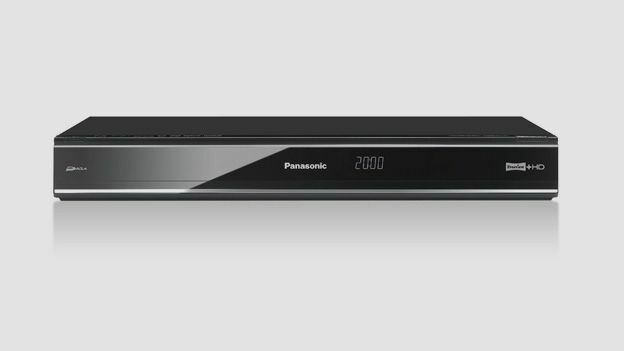 What the Panasonic DMR-HW220 lacks in cosmetic Va Va Voom, it more than makes up for in bloody-minded functionality. This Freeview HD recorder's feature-cup runneth over, offering an instant viewing upgrade for those not yet ready to buy an internet connected Smart TV. It faces off against the Echostar HDT-610R ultra-slim PVR and the Sony SVR-HDT1000. While other PVR manufacturers court weird and wild designs, Panasonic sticks to the traditional. A tad dull possibly, but this recorder is well made and relatively quiet in operation. As a Freeview HD timeshifter, the DMR-HW220 is largely peerless. It packs a massive 1TB drive, can record two channels simultaneously and permits playback before a recording is finished. Once online, it also offers access to Panasonic's pert VIERA Connect 'net portal, home to iPlayer, Netflix, YouTube, DailyMotion, Acetrax and more. The one catch is you can't access any these internet services if the deck is recording, an irritating restriction. File playback from USB is top notch, with MKV, AVI, MOV and other video file types accesible. Across a network from a NAS it's a tad less useful, with MKV going AWOL. The DMR-HW220 sports a standard jack pack: HDMI, optical audio, stereo phonos, plus Ethernet. Wi-Fi is built-in. There's also a front-facing SD card slot and USB media reader. Image quality is outstanding, with recordings transparent to source. This means you get particularly fine results from the BBC and ITV HD channels. Significantly, the deck also makes a nice job of upscaling SD channels. The recorder is also 3D capable, allowing you to depth convert 2D programmes into faux-D and playback stereo MPO format digital images. The latter is kinda useful, the former is not. MP3s can be copied from USB to the HDD, allowing the deck to double as a media jukebox of sorts. The Panasonic DMR-HW220 is both a high-performance Freeview HD recorder and a polished internet TV streamer. Timeshift from the terrestrial HD channels and recordings prickle with detail, and subtle gradations. Pop online to Panasonic's VIERA Connect portal, and you're also spoilt for choice. In addition to heavy-hitters like the BBC iPlayer and YouTube, there's Netflix, Fetch TV and Acetrax video-on-demand, assorted news and internet radio apps. Unfortunately you can't stream while the deck is in record mode, or play back files from USB. Overall though, this is a well-equipped digital recorder, made all the more desirable by that humungous 1TB drive.